Amongst the three candidates that competed in the internal battle for candidacy in the “Por México al Frente” (PAN-PRD-Movimiento Ciudadano) coalition, the PAN’s politician, Ricardo Anaya, razed over Miguel Ángel Mancera and Rafael Moreno Valle in Google Trends searches. To measure how much Internet users searched for each of the applicants, Google Trends established a scale from 0 to 100, where 100 is the maximum score. 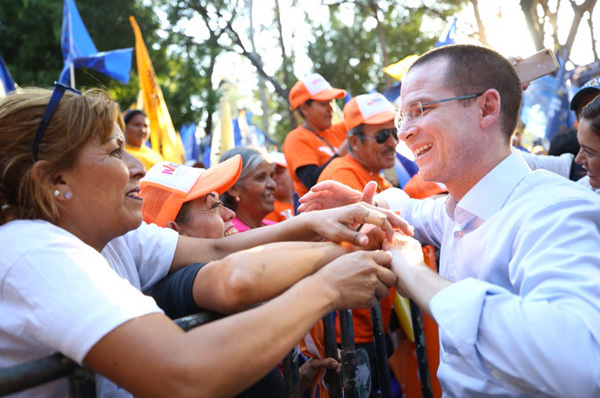 This trend was obtained from searches on something related to Ricardo Anaya since October 2017, when “El Frente” was being conformed, and February 2018, after the coalition announced his candidacy. Ricardo Anaya, razed over Miguel Ángel Mancera and Rafael Moreno Valle in Google Trends searches. Anaya had a 57.5 points average (Google Trends score) between October and February. Way on top from the second and third place. 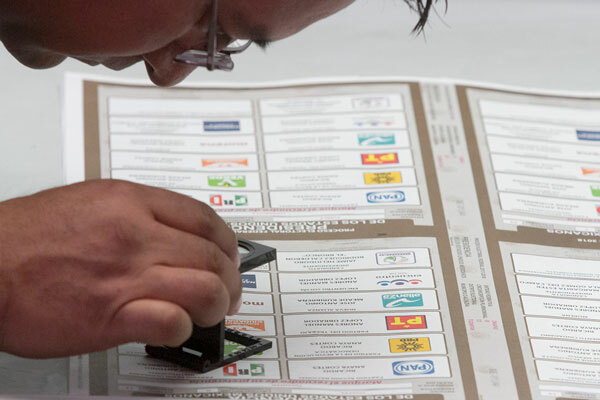 Miguel Ángel Mancera, from the PRD and former governor of Mexico City, got an average of 8.6 points while Rafael Moreno Valle, from the PAN and former governor of Puebla, obtained an 8.2 score average. However, this does not mean that the electorate has more sympathy towards Anaya: this only means that Anaya was the most googled one compared to Mancera and Moreno Valle. 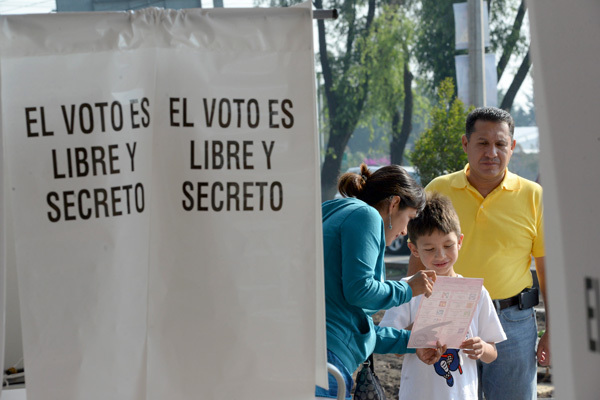 However, it is important to remark that the Google Trends tool does not discriminate between voters, for example: Mexicans that are legally allowed to vote or foreigners that live in Mexico. Which states searched the most (and the less) for these three applicants? Anaya was the most googled one in Querétaro, his home state, where he got a 100-point score between October and February. Anaya was the most googled one in Querétaro, his home state, where he got a 100-point score between October and February. 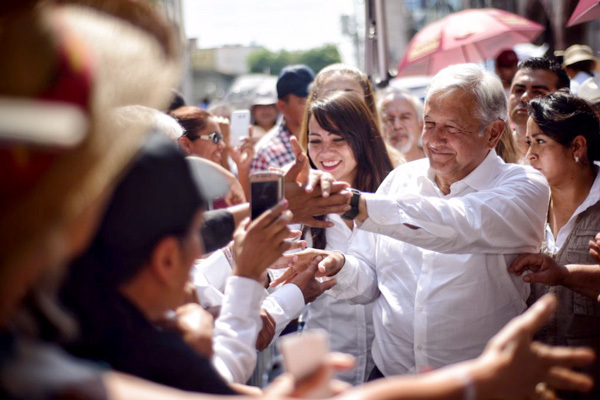 Anaya’s trend was not so strong in the southern part of Mexico, in states like Oaxaca, where he got 43 points, Tabasco (home state of López Obrador, Morena’s candidate and Anaya’s strongest rival), and Campeche, where he obtained a 20-points score. Tabasco, AMLO’s home state, became the second place with more interest towards Anaya. However, if we only analyze February’s numbers, Google’s data indicates a change in these tendencies. With a 94 points score, Tabasco, AMLO’s home state, became the second place with more interest towards Anaya. 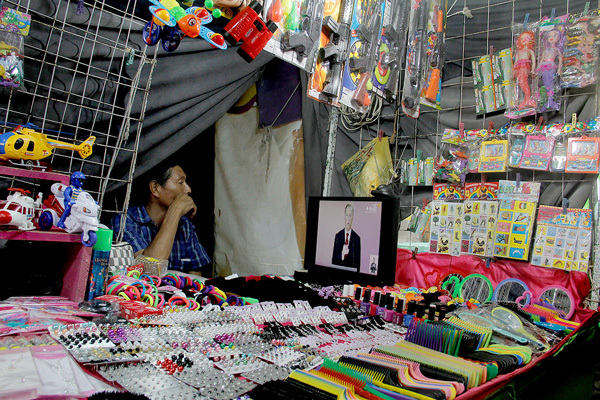 This means that internet users from Tabasco showed a greater interest in Ricardo Anaya’s searches after he was announced as the unique candidate of el Frente and, therefore, he became an opponent to López Obrador. 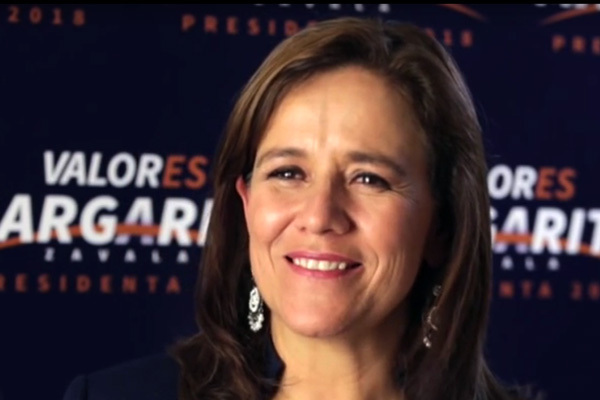 In Puebla, a state that was governed by Rafael Moreno Valle between 2011 and 2017, this candidate was the most googled (66 points score). 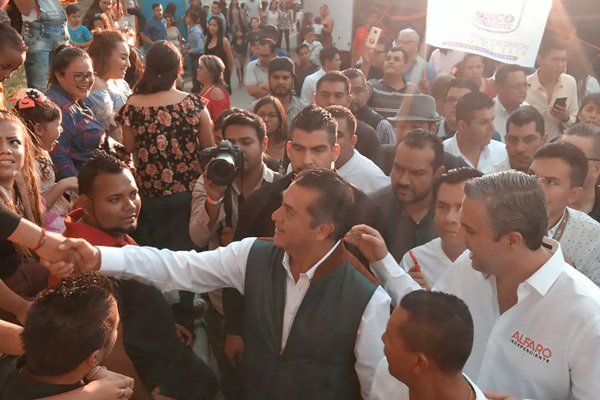 Moreno Valle also had high rates of search in Tlaxcala, Puebla’s closest state, where he got a 36-points score, and in Colima, where he got a 14-points score. Coahuila (2), Queretaro (2) and Tabasco (1) were the states where less interest in Moreno Valle was manifested in Google searches. In Mexico City, where he was the mayor up until March 20th of 2018, Miguel Ángel Mancera won the search popularity race: he obtained a 45-points score. Up next was Tlaxcala (15 points score) and Morelos (14), states that are close to CDMX. The former governor of Mexico City was less searched in Colima (4), Campeche (3) and Nayarit. If a comparison between these three aspirants is made, the most intense month was November, when the Frente Coalition was born. If a comparison between these three aspirants is made, the most intense month was November, when the Frente Coalition was born. This month Anaya was the most searched in 13 states such as Querétaro, Nuevo León and Veracruz. Up next was Moreno Valle as he was the most looked for in 10 states like Puebla, Tamaulipas and Baja California. At last, Miguel Ángel Mancera was the most searched in 9 states including Mexico City, Tabasco, the state of Mexico and Michoacán. During a meeting in November 19th, PAN, PRD and Movimiento Ciudadano, decided to form the coalition 'Por México al Frente ', starting the race towards a unique candidacy. Rafael Moreno Valle was the first to publicly display his intentions to become the candidate for the Frente coalition on November 1, 2017. Two weeks later he was followed by Miguel Ángel Mancera, and Ricardo Anaya joined last, in mid-December. The different timing in this public display of interest is reflected on the trendline shown on the Google trends analysis. In November, Moreno Valle took the lead with an average of 21 points. Up next was Miguel Ángel Mancera, with 19.5 points and Ricardo Anaya, with an 18.2 score. Nonetheless, this trend changed drastically in December after Anaya raised his hand towards the candidacy. That is when he took the lead with an average of 46 points, surpassing the 14.2 points of Mancera and the 12.8 points of Moreno Valle. In January the gap became even bigger, especially after Moreno Valle and Mancera declined from the race: Ricardo Anaya got a 54.8 points score. 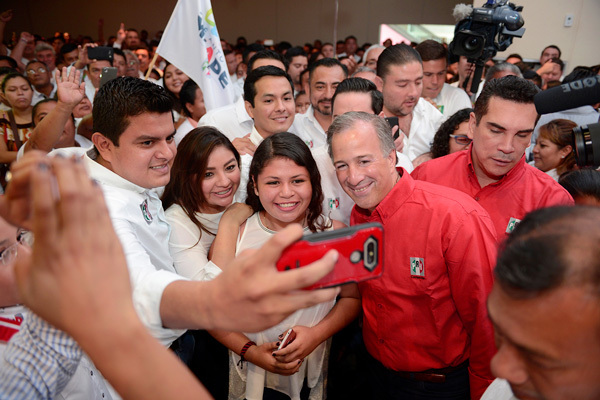 In February, these trends increased in Anaya’s favor: he obtained a search trend of 56.5 points, against 8.2 from Moreno Valle, and 7.4 from Mancera.